The more Gold OA comes to be accepted as the best or only way to achieve immediate OA, the more entrenched will the large commercial publishers that now dominate the STEM journal publishing business will become entrenched as an oligopoly. The best, but perhaps the hardest, way to win back the freedom to control scholarly communication by universities is for every journal to be backed by a large enough endowment to cover full costs (which will be lower than the costs of commercial publication because they will include only direct costs, not profits). The model here is the Stanford Encyclopedia of Philosophy, which is fully funded by an endowment. It is the model for which all OA advocates should aspire. I am still not convinced by this Monitoring the Transition to Open Access report, but maybe I am wrong. As the methodology behind it is still not available any review of it is hard. Within the report I could not find how currency exchange fluctuation might have influenced the raise in APCs. I think the Pound lost approx.11% against the Euro and 9% against USD in 2016 compared to 2015. How does this get reflected in the report if most publishers charge in Euro or USD? Does anyone know? Data for article-processing charges (APCs) and subscriptions used in the study came largely from published datasets rather than having to be gathered for the purposes of the research. UK APC data for from 2013-2016 were derived from datasets made available by Jisc on GitHub (Shamash, 2017). These data were processed before their publication by Jisc in various ways including data cleaning, normalization and deduplication as described by Shamash (2017). “APCs calculated from another currency have used the exchange rate of the date of payment wherever this is available” (Shamash, 2017, Article-processing charges/Autogenerate APC report. Section 2.3.6). Shamash, K. (2017). Article processing charges. Retrieved from https://github.com/kshamash/Article-processing-charges. So we do see the exchange rate effect. A UK University library paid GBP1,422 to settle a €2.000 APC invoice July 1st, 2015 against GBP1,659 July 1st, 2016: a 16% increase driven by exchange rate. The way described in the Monitoring Report makes it look as if the publishers are driving this increase. This is false. It is a similar pitfall with VAT by the way. 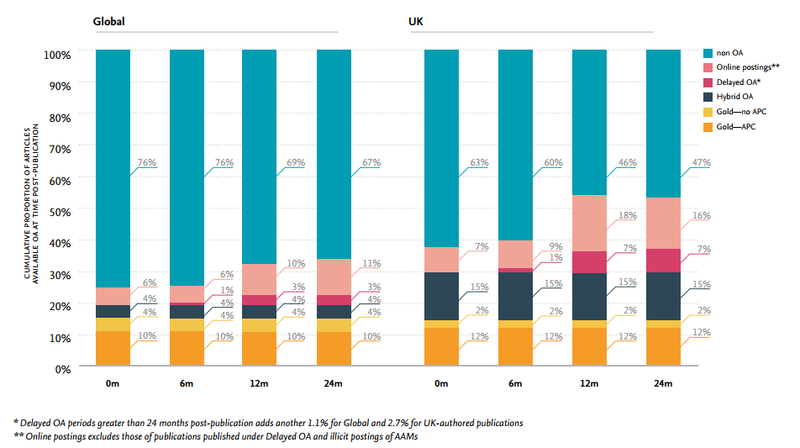 Within the APC data on GitHub a UK based publisher will always appear more expensive for a UK institute because of the 20% VAT being included within their payment made. The fact that the data is not collecting the net invoice amounts makes an meaningful analysis and comparison almost impossible. Any thoughts? Gold OA is a great democratization of science. It is revolutionary in scope and can help dispel barriers between scientists and the public. But in the age of the internet, the temptations for publishers to simply milk the system are too great. Major journals need to be shifted to a not-for-profit ownership – either run from University presses or from community organisations such as the IET and IEEE.